With your system connected to the internet, you can remotely view you cameras from your tablet, smartphone, or pc. Receive email notifications whenever the camera detects any movement. Why should I choose eco HD-TVI cameras over regular ones? eco HD-TVI was created with the commitment of advanced high definition technology that is energy efficient. For cameras that run 24/7, electricity bills may be a concern. 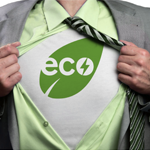 With eco cameras, your energy consumption can be reduced by 30%! © 2016 Infinite Service Group Inc., All Rights Reserved.